OK, say Cheeeese. Wait, Jesus, move to your left a little. No, your other left. That's it. Say Cheeeeese, now hold it...WTF! Damn you time traveler!! Communion, an ancient pagan ritual stolen and practiced by the cultish Roman Catholic church and one or two other forms of Christianity, consists of walking up an aisle, kneeling before an old man, and letting the old man stick a piece of squishy tasting bread into your mouth. 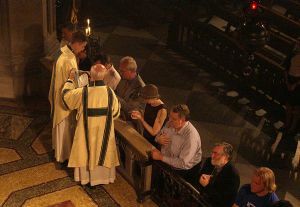 The pope's employees start people doing this in a related ritual called "First Communion", which is only performed once. Its purpose is to gather money from proud parents, as well as prepare children (and other highly-impressionable domesticated apes) to believe that they must come back every week to get a piece of bread from the old man, and gladly pay the cult for the privilege of doing so, thank you very much, for the rest of their natural lives. The first historical instance of Communion was also the last (that's a pun, Son [of God]). Jesus got hungry because he knew he was going to be nailed onto a piece of wood, and decided to have a sit-down meal with his buds. Calling it his "last supper" (which obtained a tremoundous laugh throughout the room), the wizard asked his disciples to sit on the same side of a very long table to feast and consume vast quantities of alcohol. Jesus told them he wanted to celebrate the fact that one of his own coven members was going to sell him to the wolves for a few coins and a pat on the back. Jesus ate and drank, drank and ate, all the time knowing that the spotlight would soon shine on him and--ta da!--his dramatic and glorious exit. The last supper dragged on and on, and the wizard still ate, drank, and patted the dancing girls on the backside as he told nuggets of data to the people who followed him around. They, once again, had no idea what the fnord he was talking about. One of the things he told them, while dipping bread into a dish of the region's really fine olive oil, was "Look at this, boys. This bread is as real as I am in your mental image of me and the environment as a whole. So this, in a literal definition of how the mind works, is my body - at least to your brain's readout. And so is this chair, and that bird, and this fine woman dancing here. Come sit on papa's lap sweetcakes." "And taste this good wine?" Jesus went on, sipping the good wine. "This is my blood if you can believe it. You can label anything you perceive in the creation which takes place in your brain anything you want to, because it's all an image on a screen in your brain. And you can feel or not feel any emotion about any part of it that you want to, once you can get a handle on the tiny bursts of chemicals you call emotion. This even explains why I tell you to 'Love your enemy', or to 'Judge not so you won't be judged'. Because your 'enemy' is only an image that you've created in your brain! What are you going to do, hate your brain? And just who is doing the judging on what? Huh?" The disciples just ignored the wizard, having heard all of this hundreds of times before, not one of them ever having a clue to what he was talking about. A couple of them wrote down some of what Jesus said, but as always only wrote down a few words of it, and couldn't even get the essence of those right. Jesus just shook his head and kept on eating and drinking and patting. Then, after fighting off his posse who had turned on him en masse, the wizard pulled up his drawers and walked over to a park to sweat out some blood before the goons showed up. Well, lo and behold, the wizard beame a cash cow as soon as the nails were pulled out. Because before you can say "It is finished" a coniving priest or greedy nun or constipated pope figured out a way to turn Jesus' last supper into a funding scheme of epic proportions. Ka-ching! The Catholic Church had an easy time selling communion. People were glad to be able to put Jesus in their mouth, what could be better? Catholic Inc. then told people that only their priests had a vague special power to turn bread and wine into the body and blood of a Jewish hippie handyman. Life is good when you are Pope. So as Catholics eat Jesus in this yummy ritual of blatant cannibalism (not that there's anything wrong with it), they feel happy, holy, and wheaty all at the same time. But few meditate on the fact that if the bread actually is the living Jesus himself, then he is at that exact moment being melted, torn to pieces, and hideously burned in the destructive gastric digestive juices, hydrochloric acid, and pepsin bile of their stomach. If you listen closely you can almost hear the little guy softly squeaking "Father, forgive these gastric juices, acids, and bile, for they know not what they do". The 'Jesus bread' itself is now baked by mad monks from a secret recipe handed down from generation to generation for over 2,000 years. Jesuit culinary scientists have attempted to reverse-engineer the recipe, but to no avail. It is thought to contain wheat, salt, self-raising flour (to symbolise Jesus' fabled resurrection - another event powered by yeast), a blend of 13 holy herbs and spices, and carpenter. 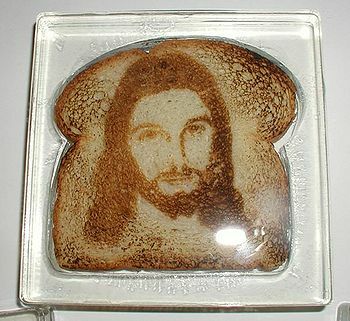 Many people who can't eat wheat get sick from eating 'Jesus bread'. Therefore, one out of every 133 human beings is officially allergic to Jesus. Jesus' words have been twisted into something that looks like this. Where are the dancing girls? During the ritual the thin wafers are blessed by a priest, at which point they theoretically briefly come alive after being eaten. Again, this isn't seen as cannibalism (not that there's anything wrong with it) by modern society or by the pro-wafer news media. They figure that since Jesus is immortal it doesn't hurt him a bit to be chewed on and swallowed (see "Mary Magdalene", the first person to swallow Jesus). A Fun Fact: The wafers have to be eaten within a five-minute window of being loaded with Jesus in order to give catholics their magical powers. Christianity is only one of several religions where the deity returns as a foodstuff (see Flying Spaghetti Monster). The miracle of this transformation of product into deity now stands as the central theory and bedrock of the Catholic religion, even though the theory completely ignores 100% of the wizard's public and private teachings, his Book of Shadows, and his other sayings, lectures, and repeated but futile attempts to shake off the morons, profiteers, control freaks and goons and pass along some real information to his fans. Consuming any tasty symbol. . .
. . .that someone claims is "Really Jesus!" leads to many side effects. Even though something is just bits of electricity on a computer screen, or a few dashes of paint on a canvas, or plastic from a mold colored to look like a beard and some clothes, some people are so taken in by the symbol that they begin to see angels out of the corner of their eyes, little sparrow-sized things that offer to grant them three wishes but then rapidly fly away before they get an answer. Others start to speak in tongues, sounding a little like a skunk mating with a drunken badger, or carry large wooden crosses throughout the streets of their own city (copycats!) and prophecize random disasters to anyone stoned enough to listen. Still others feel sexually attracted to priests, nuns, and their luscious young playthings, and often engage in three-or-fourways with these infernal creatures of the night. If any or all of these side effects persist longer than an experimental attempt at an alternative lifestyle, don't even think about seeking medical help but immediately contact your local Qualbalist Rabbi, Sufi Iman, or Scientology auditor and ask them to rid you of "Jesus" (the real Jesus would be shaking his head and eating another bowl of lentils by now). As a sidenote, some historians say that Jesus got pretty sick from all the eating and drinking at his last supper and upchucked it in the grass by the side of the road. 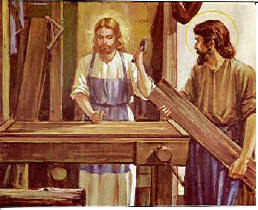 He then wrote upon the remains of his last supper with his forefinger: "Who is the wizard that makes the grass green? ", upchucked again, then cleaned himself up a bit before jogging down to the park. UnNews:Communion gets a makeover. Meet: ‘Jesus Cakes'!